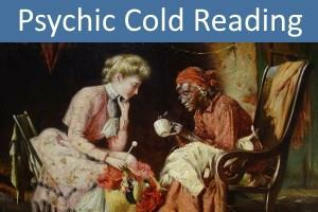 cold reading "In the course of a successful reading, the psychic may provide most of the words, but it is the client that provides most of the meaning and all of the significance." --Ian Rowland (2000: 60) Cold reading refers to a set of techniques used by professional manipu-lators to get a subject to behave in a certain way or to think that the cold reader has some sort of special ability that allows him to "mysteriously" know things about the subject. Cold reading goes beyond the usual tools of manipulation: suggestion and flattery. In cold reading, salespersons, hypnotists, advertising pros, faith healers, con men, and some therapists bank on their subject's inclination to find more meaning in a situation than there actually is. The desire to make sense out of experience can lead us to many wonderful discoveries, but it can also lead us to many follies. The manipulator knows that his mark will be inclined to try to make sense out of whatever he is told, no matter how farfetched or improbable. He knows, too, that people are generally selfcentered, that we tend to have unrealistic views of oursel - ves, and that we will generally accept claims about ourselves that reflect not how we are or even how we really think we are but how we wish we were or think we should be. He also knows that for every several claims he makes about you that you reject as being inaccurate, he will make one that meets with your approval; and he knows that you are likely to remember the hits he makes and forget the misses. Thus, a good manipulator can provide a reading of a total stranger, which will make the stranger feel that the manipulator possesses some special power.